Stranger Things fans! 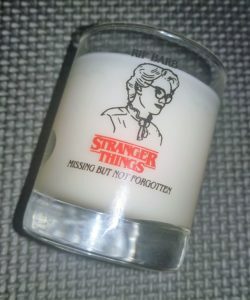 Many of you lamented the loss of Barb in Season 1 of the series, and though we’ve been assured she won’t be back in season 2, Netflix did decide to commemorate her loss with a memorial candle. Here’s your chance to get your hands on this promotional item and mourn Barb in style. You have until Thursday, 2nd November at 8pm PT to enter when we’ll randomly select our winner. * Because of the prohibitive cost of shipping abroad, we regret that this contest is only available to ship in the United States, but if you want to hire a service that’ll forward it on to you, we’re fine with that (you’ll have to search for one for yourself and just give us an address where it’s going). **Fyi, your information will only ever be used to contact you if you win. I promise we don’t sell it, and won’t spam you.